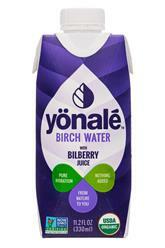 Yönale is a line of birch tree water beverages made with ingredients sourced from Finland. The USDA Organic certified line presently includes two flavors, original and with bilberry juice. The original flavor is made only with birch tree water, while the bilberry variety is made with birch tree water and 5 percent bilberry juice. To that end, both products have extremely clean and straightforward flavor profiles and contain only 20 calories per 11.2 oz. container. 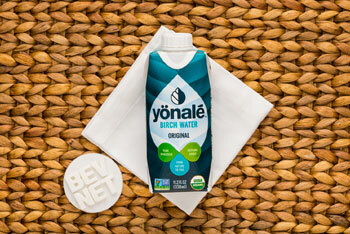 In terms of the unflavored pure SKU, Yönale has created a pure and simple drink from one ingredient. Compared with coconut water or maple water, birch water is much lighter and not far off from a still mineral water. There’s no sweetness and a faint earthiness. The bilberry variety has much more flavor to it. The juice has a slightly tart and sour flavor and lacks sweetness. You can still taste the birch tree water, but it’s much more of a background note. That said, this tastes much more like a fruit flavored water than the pure variety. In the end, both of these flavors are drinkable, but neither is overly compelling or memorable. That will certainly be a challenge for this brand, especially when it comes to building a loyal consumer base. Yönale’s branding and packaging could certainly help with this -- at least in terms of telling the consumer why they should be drinking birch water. Unfortunately, the packaging doesn’t do this and instead focuses on the product’s natural “roots.” This messaging feels similar to other products out there and does not make the case for birch water or its benefits. Beyond that, the packaging is colorful and speaks to what Yönale is. Birch water is front and center, as is the product’s USDA Organic and Non-GMO Project verifications. The only thing we’d change are the callouts, which are visually distracting and, for the most part, offer conceptual rather than tangible descriptors. Overall, Yönale is a fine tasting birch water, but the strategy for this product seems to largely be banking on existing awareness and demand for what is a very small category. This seems like a somewhat flawed approach that could potentially relegate the brand to being a value oriented player within this niche, as opposed to helping it become an anchor brand.